Now that the semester is nearly over, college students everywhere – from the Rockville area and across the country – will be cleaning and moving out of their dorm rooms. This can be an arduous task for students. Even though the dorm rooms are usually on the smaller side, they tend to accumulate a lot of things during the school year. Of course, after the end of each spring semester, college students have to clean all of their belongings out of their dorm rooms. Most colleges use these dorm rooms to house students for summer classes, and therefore require that all belongings be removed – and a thorough cleaning done – by a certain deadline. Clean off your desk and pack up books, supplies, and laptops. Clean out your trunk or dresser and place folded clothing on your bed. Clean out your closet and remove clothing; fold and place the clothing on your bed. Pack all of your clothes in duffel bags and/or suitcases. Remove all bedding, blankets, and pillows from the bed and pack in a large bag. Now that all the pieces of dorm furniture are cleared off, they are ready for a thorough cleaning. Wipe down the desk and the trunk with cleaning wipes and clean the inside of the closet, wiping it down as necessary. The bed can be sprayed with a disinfectant spray for freshness. Always have large trash bags on hand to throw away unwanted clutter. If you have a refrigerator and/or microwave, clean them out, wipe them down, and throw away any remaining food you no longer want. Clean out the bathroom if there is one inside your dorm room. Pack away all toiletries and clean the bathroom thoroughly. As a college student living on your own now, you are learning how to become independent. 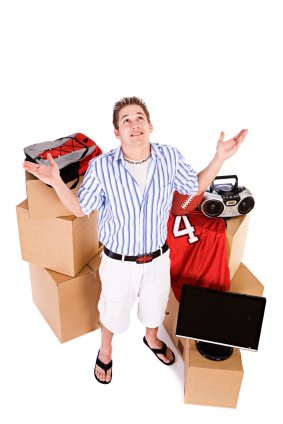 You are responsible for your own living quarters – clearing them out and cleaning them per school regulations. If there is no time in your schedule to clean the dorm room thoroughly or you need any additional help, you can call on a professional cleaning service to professionally clean for you. Keeping small places clean is not easy, and good cleaning habits will keep your roommates happy and your parents impressed! This entry was posted in Moving, Organization on May 2, 2017 by HSE.